This recipe is 8 SmartPoints per wrap. In a medium sized bowl, combine the drained tuna, salt and pepper and olive oil. Mix completely. Place a tortilla on a small plate. Spread 3 Tablespoons of hummus on the tortilla. 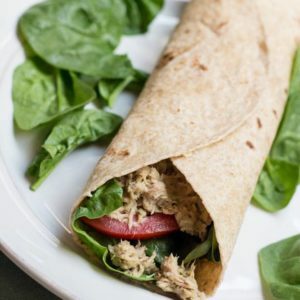 Split the tuna salad and place each half on the tortilla. Add lettuce and tomato, if using, and wrap up. Here is a homemade hummus recipe that's easy to make.